The same major geological upheaval that raised the Himalayas in Asia and the Alps in Europe created South America’s northeastern Andes Mountains. The resulting toothy-edged peaks that rose from the tectonic shift blocked ancient rivers that flowed northwest into the Caribbean Sea, then formed new waterways that drained instead into the Atlantic. The natural diversion of waterflow gave birth to what we now know as the largest river basin in the world, the Amazon. Discoveries as recent as 1998 disprove an earlier theory about the beginnings of the Amazon: that the continent hosted a shallow sea during the Early Miocene epoch and, instead, points to a freshwater habitat – a large wetland fed by a vast network of waterways. 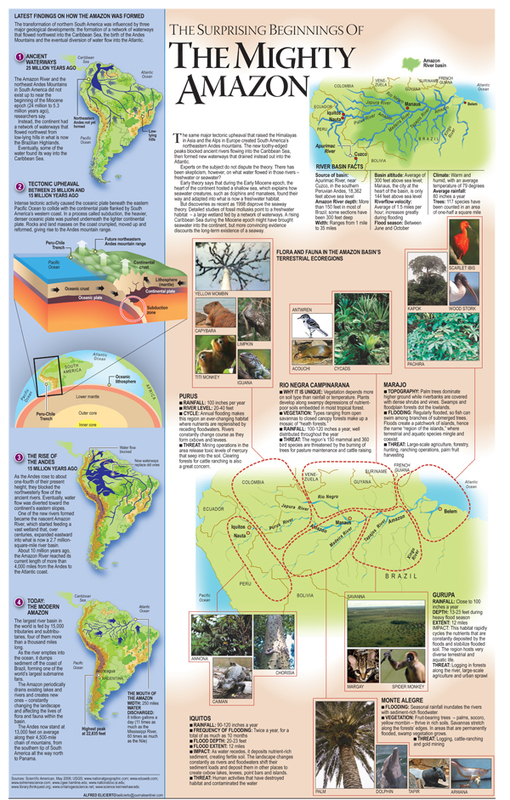 Story and graphics by Alfred Elicierto, published in the Milwaukee Journal Sentinel on May 22, 2006.